The results of controlled studies show that Dead Sea salts are an effective, natural treatment for psoriasis with no known side effects. Dead Sea Salt - Give it a Try! Natural, unprocessed Dead Sea Salts differ from regular sea salts because they contain a very high percentage of beneficial minerals that can be absorbed through the skin. 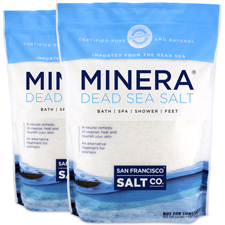 Just to give you an idea of how they differ from common seal salts, salts from the Pacific Ocean typically consist of 98 – 99% sodium chloride, Dead Sea Salt contains only 5% sodium chloride, the rest of the salt is made up of beneficial minerals such as magnesium & potassium. When Dead Sea Salts are added to bath water, or used in other treatments such as wraps, these minerals can be absorbed through the skin. The minerals work in a variety of ways to improve skin health, speed healing, relieve itching and reduce redness. 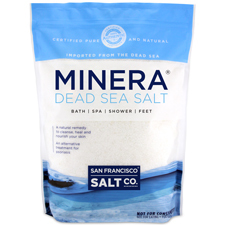 See the "HEALING PROPERTIES" tab for mineral breakdowns of Dead Sea Salt. Several studies have been conducted to test the effectiveness of Dead Sea Salt in treating Psoriasis. These studies have shown that a high percentage of psoriasis sufferers benefit from a regular treatment program using Dead Sea Salt. See the "CONTROLLED STUDIES" tab for more information on the studies of Dead Sea Salt for Psoriasis. Phase 1: Wash body and hair with preferred products before bathing. Simply add 2 - 3lbs (6-8 cups) of salt to a warm running bath, when the salt has dissolved slip in and relax for approximately 20 minutes. Take 3 baths per week for 2 – 4 weeks. Rinse or shower with fresh water after bathing. Phase 2: After symptoms subside, reduce to a maintenance level. This is different for everyone - try 1 bath per week using the same process as phase 1. Phase 2: After symptoms subside, reduce to a maintenance level. This is different for everyone - try 1 wrap per week using the same process as phase 1. A series of clinical research studies have been conducted in order to evaluate the effectiveness of Dead Sea salts as treatment for psoriasis. According to several published studies, about 80% - 90% of psoriasis patients visiting the Dead Sea for treatment are either completely cured or significantly improve. Most of us don’t have the time or the money to travel to the Dead Sea, as a result more studies have been conducted to test the effectiveness of Dead Sea salts when used at home. The results indeed show that Dead Sea salts are effective in improving the symptoms of psoriasis – take a look for yourself! Dr. J. Arndt conducted a controlled study involving 50 psoriasis patients, between 14 and 77 years of age. All patients were treated using Dead Sea salts in partial or full baths and were treated with the salts in a controlled way. In a full bath, 2 kgs of the salts were dissolved in a bath at a temperature of 27 C. The partial baths were made with a concentration of about 10%. The baths lasted for 20 minutes and followed by a rinse. The patient remains in a warm, packed condition after the bath to enhance the effect of the salts.